Pocket, 1979-01-03. January 1974. Paperback. Used:Good. 1979-01-03. New. Ships with Tracking Number! INTERNATIONAL WORLDWIDE Shipping available. Buy with confidence, excellent customer service! 1973-12-01. New. Ships with Tracking Number! INTERNATIONAL WORLDWIDE Shipping available. Buy with confidence, excellent customer service! 1973-03-01. New. Ships with Tracking Number! INTERNATIONAL WORLDWIDE Shipping available. Buy with confidence, excellent customer service! 1979-01-03. Good. Ships with Tracking Number! INTERNATIONAL WORLDWIDE Shipping available. May not contain Access Codes or Supplements. May be ex-library. Shipping & Handling by region. Buy with confidence, excellent customer service! Easton Press, 1972-01-01. Leather Bound. Used:Good. Easton Press. Collectible - Very Good. Norwalk: The Easton Press, 1972. Sm 4to. Leather with raised bands, gilt spine and decorative boards, edges and silk ribbon marker. 602pp. Near fine. The Library of the Presidents Collector's Notes pamphlet laid in. A very attractive copy! Inquire if you need further information. Norwalk, Conn.: The Easton Press. Collector's Edition. Fine in full dark blue leather covered boards with two raised bands on the spine with gilt text and decorations stamped in the compartments and with gilt tool work on both the front and rear boards. The end papers are silk with a matching silk placement ribbon sewn-in at the head of the spine. All three edges of the text block are gilt. A small quarto measuring 9" tall by 6" deep containing 602 pages including an index and text. One of the volumes in The Easton Press' collection of The Library Of The Presidents series. A beautiful, tight, clean copy with no dates or inscriptions and no prior owner's book plates. on the fly title page. US: Easton Press, 1972. Easton Press. Leather Bound. Fine/No DJ. 9.5 x 6 x 1.7 inches. Beautiful leatherbound Easton Press Edition. Text tight and clean; no markings from previous owners; full leather over moire silk endpapers. Raised bands on the spine, with gold decorations and titles on spine and cover. All edges gilt. Silk bookmarker. Norwalk, Connecticut: Easton Press, . Hardcover. Fine Condition. The Library of the Presidents. Bound in the publisher's original forest green composition leather with the covers and spine stamped in gilt. Two raised bands on the spine. All edges gilt. Norwalk, Connecticut: Easton Press. Fine. 1972. Hardcover. Bound in full leather. Gray leather with 22kt gold trim. Luxury features include gilded page edges, archival quality paper, and a sewn-in satin bookmark. Part of The Library of the Presidents series by Easton Press. Ships same or next business day well protected in a box. .
Morrow, 1973. Book. Very Good. Cloth. Signed by Author(s). First Edition. Signed by Margaret Truman and Truman's grandson Clifton Daniel, with names only. A neat and sound copy. Unmarked pages with square tight binding. With photo section. Covers with modest shelfwear; corners are rubbed through at tips. Ends have a few small foxspots. Name in small handwriting to endpage. Jacket with moderate wear. Heavy and bulky, so please allow for international shipping. Benefits the Friends of the Albany, CA library..
Morrow. Hardcover. 0688000053 New Condition. . New. Pocket. PAPERBACK. 0671786474 New Condition. . New. Avon Books. PAPERBACK. 0380721120 New Condition. . New. 1973-12-01. Good. Ships with Tracking Number! INTERNATIONAL WORLDWIDE Shipping available. May not contain Access Codes or Supplements. May be ex-library. Shipping & Handling by region. Buy with confidence, excellent customer service! Norwald, Connecticut: The Easton Press. As New. 1972. Hardcover. Leather Bound. Book Condition: As New. Easton Press Library of the Presidents; green leather with gilt decorative design, satin ribbon marker; smyth-sewn and bound in top-grain leather with a raised bands on spine; printed on specially milled acid-neutral paper. A beautiful copy. ; 8vo. ; 602 pp pages . William Morrow & Co, 1984-09-01. Paperback. Used:Good. Norwalk, CT: Easton Press. F/No Dustjacket. (c1972). Ltd Edition. Leather. [The Library of the Presidents] . 8vo., 602 pp., bookplate . Easton Press. LEATHER BOUND. B074VNM88H Harry S. Truman (Easton Press) Leather Bound by Margaret Truman (Author) tight clean copy . Fine. Easton Press, 1972-01-01. Leather Bound. LikeNew. .
New York: Morrow. 1973. First Edition; Fifth Printing. Hardcover. 0688000053 . Very Good+ in a Very Good+ dust jacket. Bumping at spine crown/heel. Spotting at top of text block. ; 9.3 X 6.3 X 1.9 inches; 602 pages . Norwalk, Connecticut: The Easton Press. Clean, tight and square. No markings or shelf wear. Beautiful gold gilt design on covers. Email for pictures. . Very Good. Leather with Gold Guild. 1972. New York, NY: William Morrow & Company. NF/G+. 1973. Hardcover. 0688000053 . VG, bookplate to front pastedown in VG DJ that is price clipped; SIGNED BY THE AUTHOR on the front free endpaper. DJ is price-clipped, some edge wear; Not Stated; Brown cloth; 8vo; DJ; Signed by Author . Easton Press, 1972-01-01. Leather Bound. LikeNew. . Deluxe Leather Edition. Bound in Fine Genuine Leather - 22kt gold-stamped spine accents - Distinctive raised spine hubs, - Intricate gilt stamped cover designs, - Specially milled acid-neutral paper, - Smyth-sewn pages, - Gilded page edges, - Permanent satin ribbon page-marker. A Very Fine Copy. - Includes the ""Publishers Notes Insert. Norwalk, CT: The Easton Press, 1972. First edition thus. Hardcover. 602 pages. Part of the Library of the Presidents series. A very near fine copy in decorated full leather binding with all page edges gilt and bound in silk bookmarker and with a couple of tiny scratches to the fore edge of the gilt and with laid in Collector's Notes sheet. No dust jacket as issued. Easton Press Book. Fine. Full-Leather. 1973 edition, near fine condition, remainder spray on top page edge, with a very good dust jacket, small closed tear to lower edge, with a priced unclipped dust jacket flap, published by William Morrow & Company, New York, 602 pages. 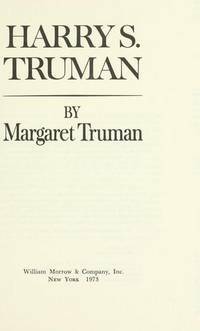 An insiders biography of Harry S. Truman by his daughter. Illustrated with photographs. .
New York : Morrow, 1973. First Edition. Fine cloth copy in a near fine dw, now mylar-sleeved. Particularly and surprisingly well-preserved; tight, bright, clean and especially sharp-cornered. ; 602 pages; Description: 602 p. : ill. ; 25 cm. Subjects: Truman, Harry S. (1884-1972) --United States --Politics and government --1945-1953. Pocket. PAPERBACK. 0671786474 Like New Condition. . Fine. Morrow. Hardcover. 0688000053 Like New Condition. . Fine. Avon Books. PAPERBACK. 0380721120 Like New Condition. . Fine. Jan 01, 1972. Leather Bound. Very Good. LEATHER BINDING. Norwalk, CT.: Easton Press, 1972. Hardcover bound in full-leather dark binding with 22-kt. gold designs, ribbed spine, presidential seal endpapers, satin ribbon page marker and all gilt edges. In very good condition with no marks or bookplates, etc., NOT EX-LIBRARY. Morrow. Used - Good. Ships from Reno, NV. Former Library book. Shows some signs of wear, and may have some markings on the inside. 100% Money Back Guarantee. Shipped to over one million happy customers. Your purchase benefits world literacy! Morrow. Used - Good. Shows some signs of wear, and may have some markings on the inside. Morrow. Used - Very Good. Ships from Reno, NV. Great condition for a used book! Minimal wear. 100% Money Back Guarantee. Shipped to over one million happy customers. Your purchase benefits world literacy! Morrow. Used - Acceptable. Former Library book. Shows definite wear, and perhaps considerable marking on inside. Morrow. Used - Good. Ships from the UK. Shows some signs of wear, and may have some markings on the inside. 100% Money Back Guarantee. Your purchase also supports literacy charities. Easton Press Book. Fine. Full-Leather. Bookplate.